As the press service of consortium Space Technologies said,15 May 2017 the contest among project organizations for the development of the orbital station MIR-2 was completed. Professional national and private project organizations took part in the contest, 23 organizations took part in the contest. According to the press service of the consortium Space Technologies, the supervisory board of the consortium decided to create an extended project team, which included the project organizations and the groups of specialists on the base of the received applications for participation in the contest. 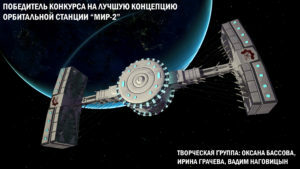 As explained in the consortium, the decision is justified by the scale of the project and the need to attract specialists from different areas, according to the supervisory board, the expanded project team will ensure that work is carried out according to the schedule: from July 01, 2017 to July 1, 2020, the draft approved concept of the orbital station “MIR-2”, from 2020 to 2022 will be approved and certified by the project with national authorities and international organizations. Also, the supervisory board of the consortium Space Technologies expressed concern about repeated attempts by foreign special services to spy and illegally collect information, hacker attacks, and therefore decided to announce the information about the participants of project team s as a commercial secret. Undoubtedly, according to the press service of the consortium Space Technologies , the consortium will additionally report on the progress of project work in the part that is not a commercial secret.